The New York Times headline notwithstanding, if the subject is treason, we’ve been there before. Several times. In spite of the headlines documenting Russian interference and possible collusion by the Trump campaign to fix the 2016 election, whatever is turned up by FBI, NSA, and congressional investigators will join a litany of other surprises in previous election years, assaults by the Republican Party on free and fair elections. Make that a pattern of assaults on the democratic process itself. 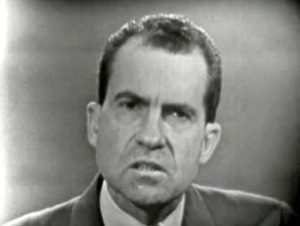 The evidence of serial Republican thuggery in the electoral process goes back to at least 1968, as Nicholas Kristof’s article makes clear, when the Nixon campaign pressured the South Vietnamese government to walk away from the peace process with the promise of a better deal if Richard Nixon won the election. It has been known for some time that Anna Chennault, widow of General Claire Chennault, leader of the Flying Tigers group during World War II, was the go-between for the discussions involving South Vietnam and the Nixon campaign. Now 91-years-old, Anna Chennault has been a fixture of GOP politics for six decades. FBI wiretaps of the South Vietnamese embassy in 1968 revealed that “[Madame] Chennault phoned South Vietnamese Ambassador Bui Diem on November 2 with the message “hold on, we are gonna win.” Before the elections President Johnson “suspected (…) Richard Nixon, of political sabotage that he called treason.” Nixon’s treason is more glaring when we consider that the Vietnam War dragged on for five more years, where more than 20,000 additional American lives were lost. Where declassification of government documents in recent years has revealed a clear pattern of treasonous behavior in 1968 on the part of Nixon, Madame Chennault, and perhaps others, the so-called 1980 October Surprise still seems to be an event that has not been fully uncovered or adequately probed, even though there was an inconclusive congressional investigation about it that ended in 1993. Although the 1980 election plot outline is similar to the notorious and treasonous 1968 October Surprise, where an incumbent Democratic president is upended by Republican operatives working with a foreign government under deep, deep cover, Republicans have, so far, escaped responsibility for engaging in treasonous activity in the 1980 election, as they clearly were guilty of in the earlier Humphrey-Nixon contest. For those who need a reminder, the hostage crisis with Iran dominated the last few months of the 1980 campaign between President Jimmy Carter and his Republican opponent, Ronald Reagan. And in an eerie parallel to the 1968 election, it was alleged that there were dealings between Reagan operatives and representatives of the Iranian government aimed at delaying the release of the American embassy hostages until after the election in return for a better deal – American weapons that were needed against Iran’s ancient foe, Iraq. On the very day of Reagan’s inauguration, the hostages were released, and according to the conventional wisdom, all of the credit for their freedom went to the former California governor, the determined tough guy who caused the Ayatollah to blink. individuals associated with the Reagan-Bush campaign of 1980 met secretly with Iranian officials to delay the release of the American hostages until after the Presidential election. For this favor, Iran was rewarded with a substantial supply of arms from Israel. 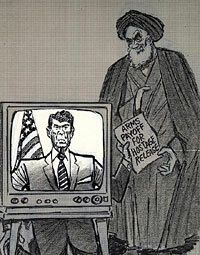 Later that year, Sick published a book, October Surprise: America’s Hostages in Iran and the Election of Ronald Reagan, in which he laid out the evidence of collusion between the Aytaollah Khomeini’s government and the Reagan team in slowing down the Carter Administration’s diplomacy focused on securing the release of the embassy personnel. Gary Sick’s work with the 1980 October Surprise was amplified by Robert Parry, a former Newsweek investigative reporter. For more than 20 years, Parry has continued his work on the October Surprise with his informative website, Consortium News. Click at this link to access a folder of his two decades of research on the Reagan administration’s collusion with the Iranian government. Iran-Contra special prosecutor Lawrence Walsh also came to suspect that that later arms-for-hostage case traced back to 1980, since it was the only way to make sense of why the Reagan-Bush team continued selling arms to Iran in 1985-86 when there was so little progress in reducing the number of American hostages then held by Iranian allies in Lebanon. When Walsh’s investigators conducted a polygraph of George H.W. Bush’s national security adviser (and former CIA officer) Donald Gregg, they added a question about Gregg’s possible participation in the secret 1980 negotiations. Despite all the evidence, the well-connected Republicans really had little to fear. In 1992, the House task force, which was assigned to look into the October Surprise mystery, was headed by centrist Democrat Lee Hamilton and hard-line Republican Henry Hyde. They and their staffs seemed more interested in dismissing the suspicions than digging for the truth. When the task force report was issued on Jan. 13, 1993, it cleared the Republicans of all charges, but that conclusion was based on tendentious interpretations of the published evidence, the withholding of many incriminating documents, and the construction of illogical alibis for top Republicans. So as we process the timely reminder that Nicholas Kristof left us last week about the 1968 October Surprise and the treasonous conduct of Richard Nixon in blocking peace negotiations that might have ended the Vietnam War much sooner, it is fitting to reflect on the work of Gary Sick, Robert Parry, and others who have left us clues and evidence that there probably was also nefarious, perhaps treasonous activity, in the closing days of the 1980 campaign. The Iran-Contra Affair, which came to light six years later, remains a telling clue about clandestine conduct that, so far, has escaped the final judgment of history. If the results of such investigations might show that the elections of 2016 and 1980 were manipulated through international collusion, every citizen needs to learn that Republican win-at-all-costs tactics are an invitation to treason. One thing is certain: we don’t need to give Republicans any more passes. Treason must have no friend and be given no excuse, for we cannot have disloyalty in this democratic society. Enough is too much. Denis Smith is a retired school administrator and a former consultant in the Ohio Department of Education’s charter school office. He writes about education issues as well as politics and constitutional reform.